After 2 workouts, lots of walking around the Flower Show and enjoying the weather walking around the city, I was exhausted. But with 8 miles on my training calendar tomorrow, I needed to power up tonight. I knew exactly what I needed: Oat Risotto. I love using oats instead of other grains for savory dishes because I always have it on hand, it cooks quickly, and it keeps a low profile. 1) Heat oven to 400 degrees. Spray baking sheet with olive oil, arrange vegetables and sprinkle with cinnamon and salt. Cook for 20+ minutes or until browned. 2) Bring water or broth to a boil. Add oats and reduce heat to medium. Cook until soft. Take off of heat. 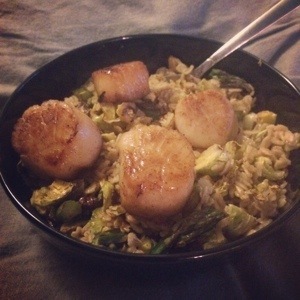 3) Spray sauté pan with olive oil and put scallops into it over medium heat. Sprinkle with salt and cook until caramelized. 4) When oats are cooked, add pecorino and mix. Add veggies and mix together. Serve, top with scallops and drizzle maple syrup over the top.